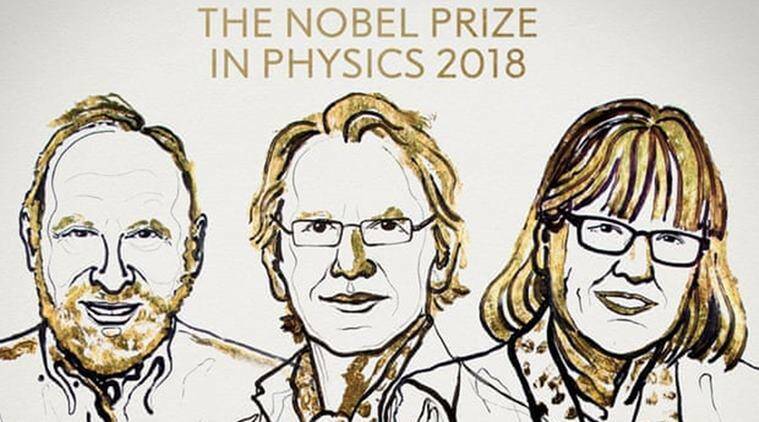 Scientists from the United States, Canada and France won the Nobel Prize in physics for revolutionizing the use of lasers in research, finding ways to make them deliver more powerful flashes of light and even to act like tiny tweezers. Explained: Why will 2019 see two Literature Nobels being awarded? Born on September 2, 1922, Ashkin is known for his pioneering work to create optical tweezers. After pursuing a BA program in Physics from Columbia college in 1947, he went on to complete a PhD in nuclear physics from Cornell University in 1952. Subsequently, he worked at the Columbia Radiation Lab from 1942 to 1945 while in the Army and at AT&T Bell Laboratories from 1952 to 1991. It was at Bell labs, that Ashkin researched on various things including non-linear optics and laser trapping. Ashkin is known to be the ‘father of laser radiation pressure.’ He did not limit his work to atoms, but also extended it to bacteria, viruses and cells. Ashkin authored Optical Trapping and Manipulation of Neutral Particles Using Lasers and holds 47 patents to his name. He is an elected fellow of APS, IEEE, and AAAS and an Honorary member of OSA for his work in the field of optical trapping and for developing optical tweezers. Gerard Mourou, another winner of the Nobel Physics prize this year, is the founding Director of the Centre for Ultra-fast Optical Science. Mourou is a scientist and a professor at Haut Collège at the École Polytechnique and A. D. Moore Distinguished University Professor Emeritus at the University of Michigan. Mourou is known for his pioneering work in the field of electrical engineering and lasers. Mourou, along with his student Donna Strickland jointly co-invented a technique called ‘chirped pulse amplification’, or CPA. He is the initiator of the Extreme Light Infrastructure (ELI) in Europe. Mourou is the recipient to many awards like the Wood Prize from the Optical Society of America, the Edgerton Prize from the SPIE, the Sarnoff Prize from the IEEE, and the 2004 IEEE/LEOS Quantum Electronics Award. He is also the fellow of the Optical Society of America and a fellow of the Institute of Electrical and Electronics Engineers and a member of the National Academy of Engineering. Strickland, who jointly won the coveted award this year along with her professor Gerard Mourou for co-inventing the CPA technique, is the third female laureate to have bagged the prize in physics, after Maria Goeppert-Mayer and Marie Curie. Strickland ‘paved the way’ for the most intense laser beams ever created by humans via a technique that stretches and then amplifies the light beam. She is a Canadian scientist at the University of Waterloo and winning the prize nearly after 55 years ended the dry spell for women winning the prestigious laurel. Strickland was born in Guelph, Ontario and is a Canadian national. She graduated with an Engineering degree in Engineering physics from McCaster Univeristy in 1981 and then obtained her PhD in Physics from the University of Rochester in New York in 1989. 1 Who is IMF's chief economist Gita Gopinath? 2 Who is Nobel Medicine Prize winner Tasuku Honjo? 3 Who is Nobel Medicine Prize winner James P Allison?